How To Use Lemon for Hair Growth - beautymunsta - free natural beauty hacks and more! Having long, strong and healthy hair is the dream of many ladies all over the world. At a certain stage for some of us our hair stops to grow and we end up confused of what to do. 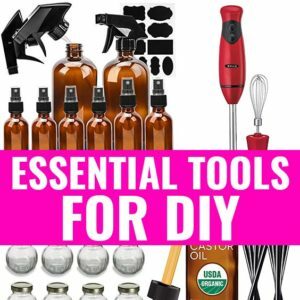 We end up spending so much money in expensive products in order to revive our hair. Split ends make your hair weak, brittle and stunt hair growth. For your hairs to remain strong and healthy, learn to trim the split end. This will push it to grow even faster and healthier. If you don’t trim split ends, they will get bigger and damage your hair strands. As we become older, our hair also ages and weakens due to the heat and usage of various hair products. The hair is bound to break or get damaged as the years pass. But ensuring the intake of plenty of antioxidant-rich food can slow down the degeneration of hair due to age. Not handling your hair properly maybe the cause of the stunted growth in your hair. Our hair grows about half an inch every month. If hair is dry and lacks moisture, it breaks off easily and you may see little or no growth with time. Stunted hair growth can be disappointing! It can affect your self-esteem and cause frustration. 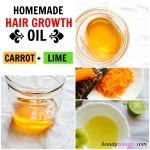 Luckily, there are various home remedies to enhance hair growth. One of the most common home remedy is the use of lemon for hair growth. To be more specific, we are looking at lemon juice. Lemon juice is a trusted ingredient believed to curb the most deadly enemy for hair growth which is dandruff. Dandruff is known to cause discomfort, especially due to itchiness, scab formation and scalp irritation. 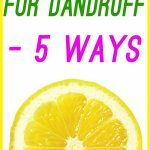 If you want to fight dandruff, squeeze the juice from a half cut lemon and massage through your hair and scalp for 5 minutes. Wash off with a shampoo and rinse well. You will never complain of dandruff again! Removing dandruff will encourage faster hair growth within days! Why Is Lemon Good for Hair Growth? 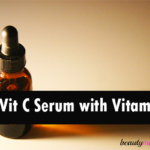 • It contains vitamin C and B minerals and folic acid, which are essential for hair growth. • Lemon has a compound called Limonene which adds life to dull hair; improving its appearance. • It has anti-fungal to fight dandruffs and other scalp infections hence boost hair growth. • Its acidity nature assists to cleanse the scalp of dead cells and other residual creating a better environment for hair to grow. • Lemon also makes hair follicles strong therefore prevent hair falling. Here are the different ways to use lemon for hair growth. Feel free to use the method that is most convenient for you! Rinsing your hair once in a while can make you feel revived. You can do just that with lemon juice instead of chemicals which can damage your hair. When you rinse your hair with lemon juice, it improves its shine and appearance. • Wash your hair with a shampoo of your choice. • Mix a quarter cup of lemon juice with a cup of warm water. 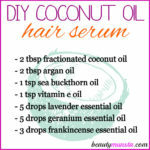 • Apply it on the hair and rub thoroughly. • Leave the mixture for two to three minutes. Apart from helping with hair growth, this lemon juice hair mask will give shine to your hair. It acts as an all natural conditioner. • Wash your hair well using a good shampoo. • To make the mask, whisk one egg with the juice from the half the lemon and then add 1 teaspoon of olive oil to the mixture. 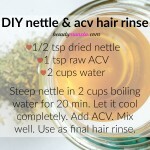 • Stir properly and then apply to your hair while still wet. • Rub thoroughly and let it sit for 20-30 minutes. • Rinse with warm water and pat it dry. Mixing lemon juice and honey can also create a good hair mask that helps to strengthen your hair, lessen the oil and improve luster. A mixture of lemon and Aloe Vera will assist to reduce split ends and avoid hair breakage hence your hair will grow with ease. • It is not advisable to use lemon juice every day since it has strong ingredients which when used in excess can bleach or even cause dryness of your hair. • In case it is left on your scalp for too long, it can cause irritation on the scalp. Lastly it is also good to dilute the mixture with carrier oils like olive oil as they will reduce breakage. • Fresh lemon juice is preferable than packaged juice as it does not have preservatives. • Do not use lemon juice on open wounds and cuts. Lemon has proven to revive the re-growth of dormant hair making soft and shiny at the same time. Amazing! Lemons are very tasty and even healthy!